In the Wild: Peninsulas etc. 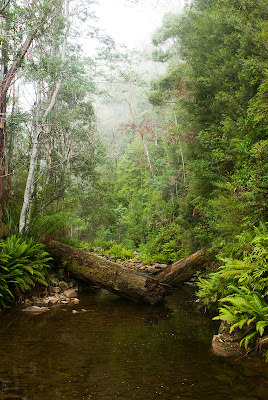 My first stop after leaving Hobart was the Hartz Mountains - as many froggers will know, this is the area where one of the most recently described Australian frogs was discovered. It's a very nice spot in its own right too, of course, however the weather when I visited was pretty ghastly. I walked up to the peak but was only ever able to see about 30m in any direction, while the biting wind almost froze the rain as it lashed any exposed skin. 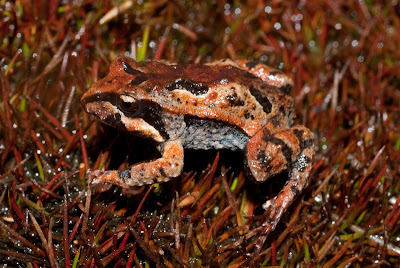 Bryobatrachus nimbus, the frog in question (or, as the generic status is sometimes in doubt, Crinia nimba) is a pretty cryptic little frog from the south-west of Tasmania which avoided discovery until 1994. Unique amongst its close relatives, the species lays its eggs on land amongst vegetation and the tadpoles do not feed at all. While atop the Ironbound range on the South coast track, I heard some of the little blighters but wasn't able to find any. Whilst walking in the Hartz I came across a patch of boggy moorland that looked about right so stopped and imitated the call. Pretty soon a couple of the frogs replied and I was able to triangulate and spot two of the little guys without much trouble. 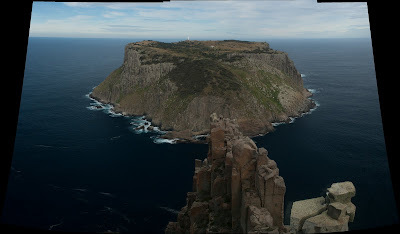 I did a nice bit of walking on the Tasman Peninsula - an overnight walk from Fortescue bay down to the tip of Cape Pillar, then around to Cape Hauy via Mt Fortescue and back to the Bay. The sea cliffs on this walk were terrifyingly awesome. From one stop I looked out to sea with my binoculars and watched dolphins play. While eating lunch on the Blade I could see seals just across the channel on Tasman Island - swimming and diving, sunbaking on the rocks, fighting, slipping in and out of the water... idyllic! I then visited the Freycinet peninsula and did some day-walking there - the Mt Amos scramble and a loop encompassing Wineglass bay and Hazard beach. 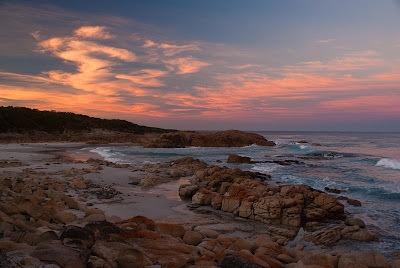 At Friendly beaches, I was treated to a spectacular sunset over the beautiful lichen-covered boulders and clear waters. David - well done on finding B. nimbus. I have only ever heard them (and they seemed to call from impenetrable clumps of moss). Just curious, did you find them out and about in the day or at night?